The goal: a polished beach look. Natural looking hair that has volume and body around the hairline while looking smooth and silky with light curls and wavy body. Jeffrey Paul is back with Zankyou to show you how to get this romantic wedding hairstyle. Here’s the second part of a real wedding style by Jeffrey Paul who first showed us how to get Los Angeles bride Alle’s beautiful and natural wedding makeup. Alle wanted to have a beachy look that lasts. We decided to create a wave all over and lift some of the hair in the back. The lift was created by the anchor we needed for the veil. 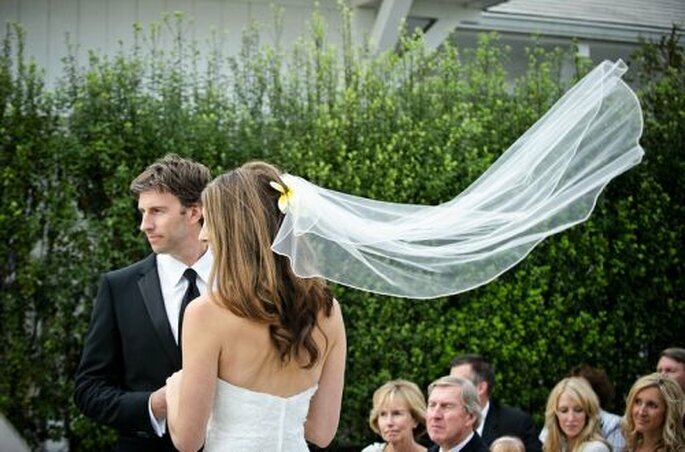 So if a long hair look is what you want for your wedding this is ideal for you. Long hair can be romantic and easy for those that have a wave or bend to their hair. The following look is easy to achieve yourself or with close friends that come to adorn you on your wedding day. Alle’s husband is from Hawaii and I suggested we use some plumerias in the back of her head where the veil would anchor. It would conceal the pins and create beauty. My first reason is to have a relaxed elegant feel and this is my favorite flower, it smells nice and reminds me of the amazing beaches in Hawaii, but for Alle it has a special tribute for Don’s grandfather. This little touch was the unifying moment for all the parties involved. How to blow-dry: Start with freshly washed hair. If you have dry hair, condition in the shower. If you have fine hair condition only the ends. Blot hair–never rub–with a towel to get rid of excess water. A blowout with super wet hair will take forever. Remember today is not the day to experiment; you can try new things or a trial run before the wedding. 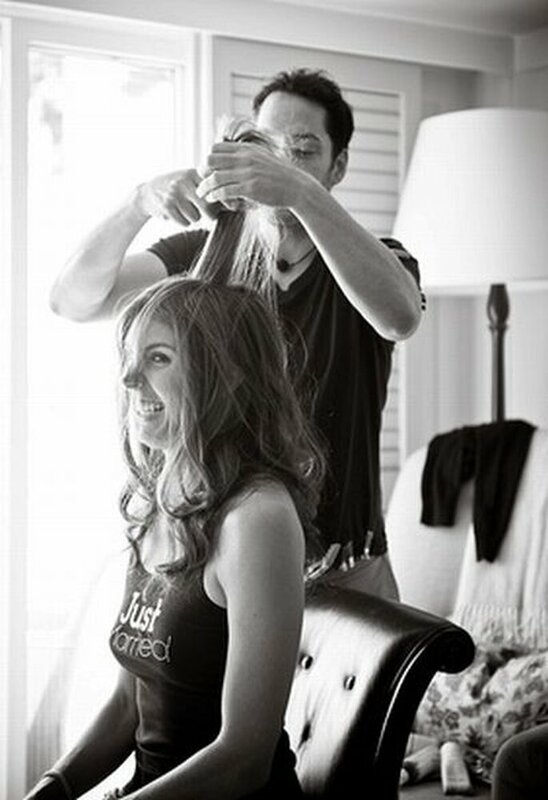 Days before your wedding its OK to do a conditioning treatment. First wrap your hair in a thick towel that absorbs water well. When you go on to blow-dry your hair properly, it should be just about damp, and then apply your products to the damp hair. Sometimes with lots of hair you have to lightly blow-dry it first. Which is what I did. To prep your hair for drying, spray It’s A 10 Miracle Leave-in Serum by It’s a 10 Haircare leave in to the hair lightly dusting your entire hair and comb through. Lift hair and spray in between the layers. Add a bit of It’s a 10 Firm Holding Gel to your palms and massage into hair mid shaft and ends. The product will easily mix with the serum and create a stronger hold where applied. The drying process is to create lift and volume. I used a paddle brush to lift the hair and run a blow dryer over it to dry it. Alle has a lot of long hair with light layers. So my goal is to semi dry it and still create a lift. With the blow dryer on medium to full air with medium heat, I massage the head loosening and lifting the hair at the root while blow-drying. This process actually shortens the drying time when styling. When the hair is less damp and not totally dry I stop and section the hair. Comb the hair lightly, divide into sections and secure with large clips. I will section the hair into 4 pieces, the very top middle, which is the crown, then the left, the right, and the back. Each section will be worked in smaller digestible chunks. •Start at the back, bottom section a 3″ wide x 1″ high section and blow dry with a large round brush. • Blow dry keeping the root up and lifted, while drying and rotating the brush. • Secure the section in a coil with a pin. • Move up the head towards the top working each piece in the section, if its too dry lightly mist it’s a 10-miracle spray before blow-drying. You are blowing each section to create volume and seal the cuticle of the hair. Finish all the pieces in the section the move to the right and left section. I do the same for the sides; except for the temples I use a much smaller round brush. This will give me more lift and shape. But still clip up while it cools. The crown: Each section in the crown is blown backwards and held in a Velcro roller to cool. The large rollers will keep the hair up off the face while you do makeup and be ready when you release them into the beachy do. Release the hair and and some wave: Now that the makeup is done we let down all the hair except the top crown. Easily with the same paddle brush I combed through Alle’s hair lengthening the curl created by pinning up the hair. With a 1” barrel curling iron, I took wide (not thick) 2-3 inch section sections and twisted them once in a backwards direction, then wrapped them around the iron. After holding for a moment I pulled the hair straight then released. The section gave me a zig-zag wave. In random sections over the head I created a beachy feel that looked wavy not curly. Anchor & the flowers: In the back of the head ½ way in-between the occipital and the crown I backcombed the hair creating a bit of lift. To support this I gathered 1″ sections to the right and left of the tease and pinned it into the teased section. This is my anchor for the veil. Prior to the event I prepared the plumerias by sewing a dozen onto a white stretchy thread. I then pinned the flowers into the hair and concealing the pins and teased section. This was on purpose to conceal the anchor for the veil and create some beauty. Spray the hair, lightly mist the hair and bangs. Release your top section: I removed the Velcro rollers and combed through with the paddle brush. The result is hair that has a bounce this was brushed back and sprayed with hair spray. If your hair has layers it should fall backwards easily, if too long you might want to secure the first ¼ on each side. Add the veil and off we go! Are you a wedding expert and would like to write for the Zankyou Magazine? Contact usand your article could be featured online! Don’t forget to sign up for our newsletter to get the best of ZK magazine, inside scoop and deals. As always, you can follow us on Twitter @Zankyou or like us on Facebook! The Perfect Hairstyles for Brides with Long Hair: Get Inspired Here! Long hair is a blessing for a wedding day, giving you a wealth of possibilities for your hairstyle. 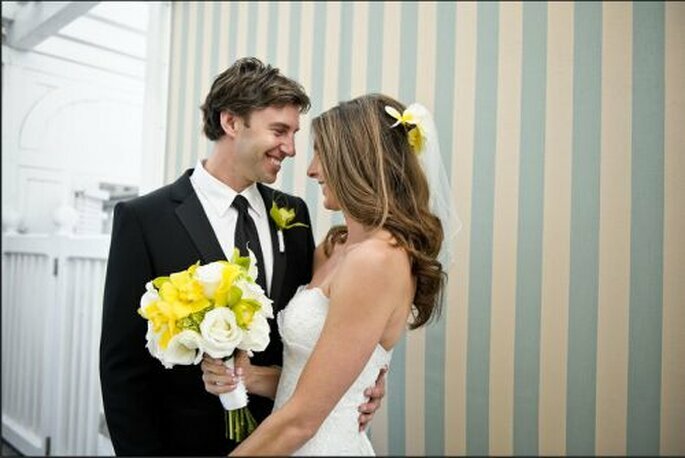 Take a look through our gallery and choose your favorite look for your big day! Take a look through our gallery of trendy hairstyles for 2018 brides... from up-do's to free-falling styles, we have you covered. Beach Wedding? Here are the Best Hairstyles for Brides and Guests Alike! Don't let a little wind and heat keep you from that beach wedding you've always dreamed of. Discover the perfect hairstyles for beach weddings! Recreate one of these 20 different hairstyles and achieve the best look for your wedding day! Discover the Italian Bun for the Most Elegant Wedding Guest Hairstyle! ¡No te pierdas este tutorial sobre recogidos para novias o invitadas clásicos y muy fáciles de hacer! Looking for an elegant yet practical and comfortable hairstyle for your wedding day? Look no further than the ponytail. Anyone knows that when a woman ties her hair back, it's about to get serious. Prepare to wow on your big day with one of these beautiful bridal ponytails. Si quieres lucir el día de tu boda un peinado sencillo y acorde a tus estilo, no te pierdas los 20 peinados de novia 2017. Naturales y sencillos, ¡los querrás todos para ti!